Offering a complete range of Couplers, Rebar, Chairs, Dowels, Ties and fabricated products. FInd out how Consolidated Power Supply can supply all of your reinforcing steel supplies - quickly and accurately. Innovative solutions to managing material on construction sites. Consolidated Power Supply can help you reduce costs associated with finding material in laydown yards, and eliminate expedited or missing materials. 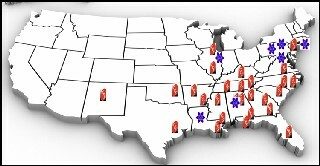 To best serve our clients, Consolidated Power Supply has offices located throughout North America.